Once you upgrade to iOS 9, take some time to peruse the Settings app to tweak it just to your liking. The Settings app is like the bedroom on every episode of Cribs: It’s where the magic happens. Whenever you update iOS on your iPhone or iPad, it pays to peruse the settings to find, enable, and configure any new features just to your liking. 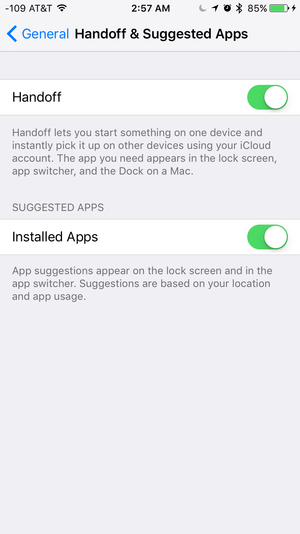 iOS 9 doesn’t have quite as many settings changes as iOS 8 did, and the best addition by far is a Search box at the top of the main Settings menu, so if you can’t remember, say, where to enable Personal Hotspot (spoiler: Cellular) or how to turn off shake-to-undo (Accessibility), all you have to do is start typing in that Search box to pinpoint exactly where your desired setting lives. Such a time-saver. Here’s a rundown of the major changes in Settings in iOS 9, as well as some key settings that didn’t change, but you still might want to revisit. If you've got any questions, hit us up in the comments. Not much is new in the Cellular settings, with the exception of SIM PIN, which used to be in the Phone settings, and now is here in Cellular. This lets you put a separate PIN code on your SIM card, so if someone had your stolen or misplaced phone, they couldn’t use your SIM card in another device. Your iPhone or iPad will prompt you to enter the SIM pin whenever you swap out the SIM (which you probably won’t do much, if ever) or when you reboot the device. SIM PIN is off by default, so if you want to use it, first you’ll turn it on. Your SIM has a default PIN on it already: For AT&T and Verizon, it’s 1111. For Sprint and T-Mobile, it’s 1234. (Great PINs, y’all.) Once you enter that—and you have to get it right within three tries or your SIM will be locked, but I believe in you—you can tap Change PIN and change it to something good. You can stick with four digits, or use more, up to eight digits total, all numbers. Again, pick something memorable because if you enter the wrong PIN too many times, your SIM will be permanently locked and you’ll have to ask your carrier for a new one. The other addition to this screen is Wi-Fi Assist, located down below the huge list of apps with toggles to allow them to use cellular data. 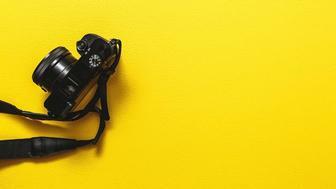 That’s on by default, and it’ll use some of your cellular data to boost a poor Wi-Fi signal. If your Wi-Fi network barely reaches every corner of your abode, you might want to leave this on. If you use up your monthly data allotment every single month, you might want to turn this off. Notifications settings didn’t change a lot, but there is a new sort order: Recent. When you select that, you’ll see the notifications in reverse chronological order, meaning the newest one is always on top. That’s great for when you notice a banner just as it’s going away, or when you hear your phone beep from across the room. In Recent mode, you also get a switch for Group By App, which means each app’s notifications will appear together, newest on top. When a newer notification comes in, all the notifications for that app will jump to the top of the list. If you don’t group the notifications by app, they’ll be grouped by day, letting you dismiss an entire day’s worth of notifications at once. If you always want a certain app’s notifications on top, change Recent to Manual, and then you get a list of every app that sends you notifications, and you can slide them to your preferred order. 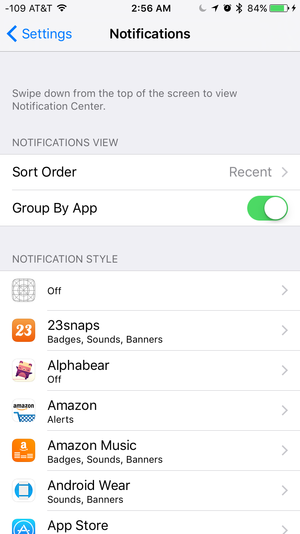 Manual mode removes the Group By App switch, since Manual grouping always groups your notifications by app. Below, is the list of your apps that have requested notifications, in alphabetical order. That makes it easy to find the app whose notifications you want to tweak, but the controls themselves haven’t changed since iOS 8. You can still decide if notifications can appear in Notification Center, on the Lock Screen, or both, and if you want to be notified in the form of vanishing banners, must-be-dismissed alerts, a badged home screen icon, or a sound. Even without much change in the Notifications settings, it’s a good idea to “audit” your notifications from time to time, since they lose their impact if you have so many coming in that you start ignoring them altogether. You can change Siri’s accent without having to change her language. 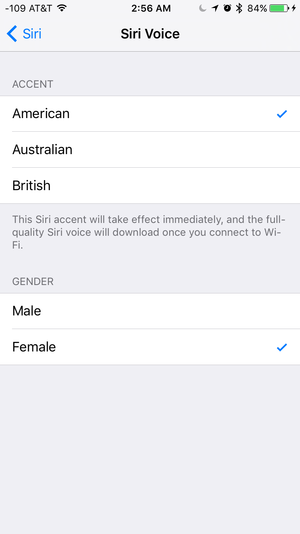 The language settings in both iOS 8 and iOS 9 include English localizations for Australia, Canada, India, New Zealand, Singapore, the UK, and the US. The top toggle on this screen is Siri Suggestions. Turn that on, and the Spotlight page will come pre-populated with suggestions before you even search for anything. This is a great new feature of iOS 9, so you should definitely try it out, but if you ever find it annoying, you can turn it off here. iOS 8 on the left. iOS 9 on the right. 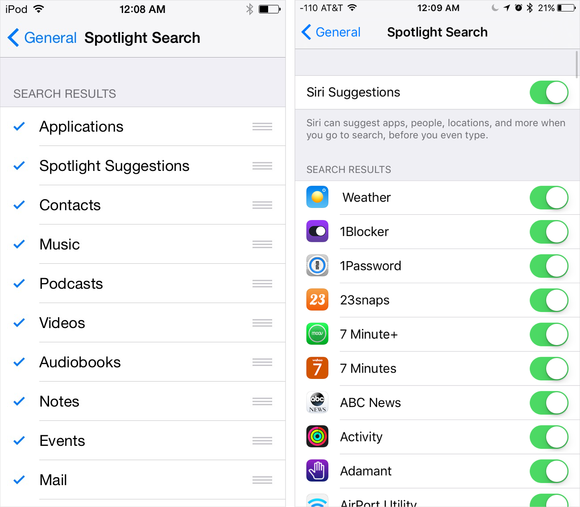 Below, there’s a list of everything that can come up in the search results, since Spotlight can now search inside of apps as well as content like your email, contacts, and calendars—well, once developers update their apps to take advantage of the new Spotlight Search API. Note that one of your choices is Settings. iOS 9 lets you search the Settings app now, both from Spotlight and with a search bar right inside the app, which is a godsend when you can’t remember where a particular setting lives. Handoff lets you pass a task from one device to another, for example starting an email on your iPad and finishing on your Mac. You can turn off this behavior here, and the setting hasn’t changed since iOS 8. Suggested apps are shown on the bottom-left corner of your lock screen and in the app switcher, based on your location or usage patterns. For example, when you are near a Target or a Starbucks, those apps’ icons will appear on your lock screen, assuming you have the apps installed and have given them permission to access your location. In iOS 9, this gets one switch, labelled “Installed Apps.” That means only apps you have installed will show up here. Aside from location, iOS 9 can suggest apps based on your patterns—when you plug in your headphones at the end of a workday, your phone could suggest the podcast app you usually listen to on your commute home. iOS 8 had two switches here: One for My Apps, and another for App Store, which would allow your phone to suggest apps you don’t even have. 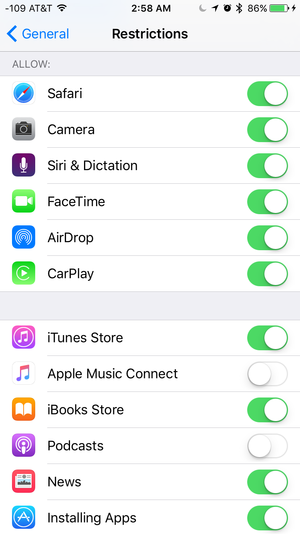 That option is gone in iOS 9.
iOS 9, like iOS 8.3 before it, supports wireless CarPlay connections, there’s a CarPlay setting here to let you set up pairing between your car and your iPhone. Keep in mind that CarPlay is iPhone only—no iPads or iPod touches allowed. You have to have an iPhone 5 or later, running at least iOS 7.1, and wireless connections require iOS 9. 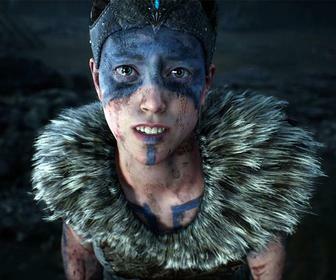 Quite a few small tweaks were made in General > Accessibility. This isn’t a comprehensive list, just the biggest changes. 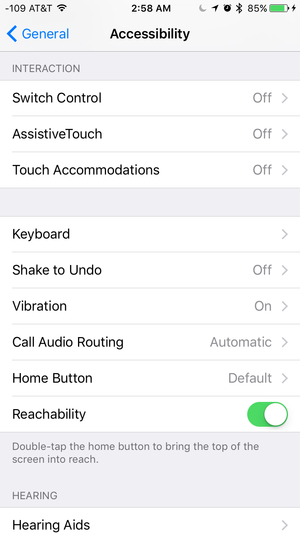 Touch Accommodations: This all-new menu in iOS 9 lets you tweak behaviors like how long you have to touch the screen to register a tap-and-hold, the duration in which multiple touches should only register as a single touch, and so on. If your normal touches and swipes don’t always result in the intended action, some experimenting with these controls could really help. The new Keyboard setting “Show Lowercase Keys” means that your software keyboard will toggle between lower-case and upper-case letters so you can always tell what kind of letter you’re about to type. Turn this switch off to keep the old always-capital keyboard from iOS 8. Shake to Undo: You can finally turn off the shake-to-undo feature here. Vibration: This master switch lets you turn off all vibration on your device, including those for emergency alerts. This is a better-named version of “Usage” in iOS 8. 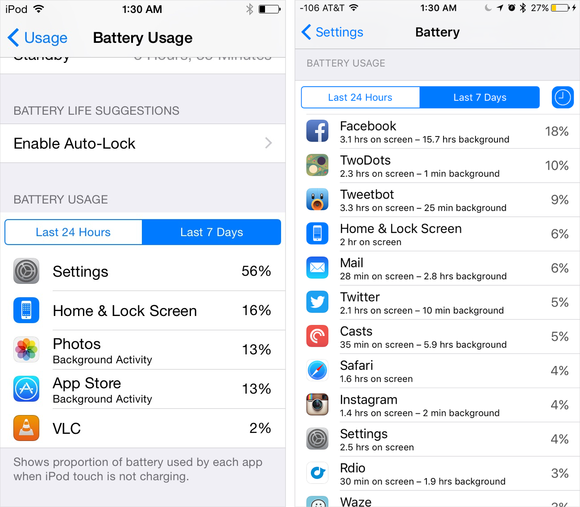 (In iOS 8, this is where you’d see your battery usage, but that’s moved to Settings > Battery in iOS 9.) This is where you’ll manage the storage on your device, as well as the files and device backups you keep in iCloud. This is where you can restrict certain things: Say, if you were giving this device to a kid and didn’t want them to have Safari or be able to install new apps or make in-app purchases. Two notable options here include switches to disable Apple Music Connect and the new News app. (Hey Apple, when can I ditch other built-in apps like Stocks?) And if you hate apps asking you if they can connect to Facebook, go to Restrictions > Facebook, and tap Don’t Allow Changes. This Settings menu in iOS 9 contains a couple of new switches to allow access to the Wallet app (formerly Passbook) and to Reply With Message from the lock screen. The all-new Battery menu lets you manually enable Low Power Mode. (Your device will also offer to go into Low Power Mode when you reach 20 percent battery remaining, and again at 10 percent. You can also see which apps have been gobbling up the most of your battery life, by percentage. iOS 9 has a new little clock icon; tap it and you’ll also see how much time each app has been running, both on your screen and in the background. I had no idea Facebook ran in the background so much. The iCloud settings have a new switch to sync the data in the News app between multiple iOS devices over iCloud. Note that News isn’t currently available for Macs, but perhaps it will be someday. 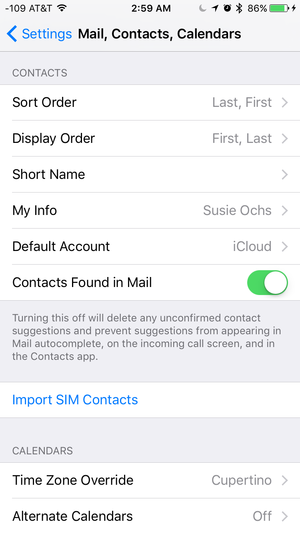 Scroll down to the Contacts section of this menu for a new switch: “Contacts Found in Mail.” This is on by default, and it lets your iPhone scan your email (on the device, not sending it up to the cloud) looking for contact information like phone numbers and email addresses. That way, it can suggest auto-complete addresses in Mail, or make an educated guess on the incoming-call screen as to who’s calling you, if that name and number aren’t in your Contacts list yet but are stashed in your email. If you don’t want this to happen, turn this switch off. Down in the Calendars section, the “Events Found in Mail” switch is also on by default. This lets the Mail app sniff out events mentioned in your email and offer to add them to your calendar for you. New Notes settings let you specify which account Siri will use when you dictate a note to her, as well as which field you want to start new notes with by default: Title, Heading, or Body. 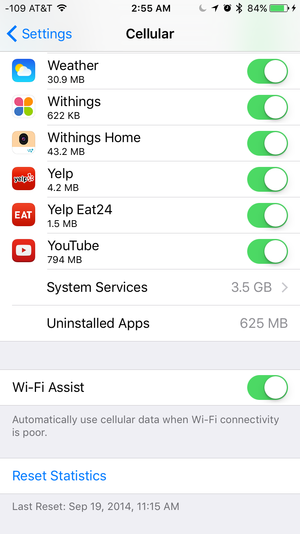 iOS 9 has HomeKit settings to allow remote access to any HomeKit-enabled devices you add to your home network, as well as to invite other people with iCloud accounts to securely connect to and control those devices. It’s a small thing, but there’s a switch in the Podcasts settings to use Custom Colors in the app, based on the artwork for each podcast. If you like how the Music app (and iTunes on the desktop) change colors based on what you’re listening to, keep this enabled.